Jonckheere is a motor coach and bus builder. Founded in 1881 by Henri Jonckheere in Roeselare, Belgium. In 1881, Henri Jonckheere began to build horse drawn car-riages in the town of Beveren, near Roeselare in the province of West-Flanders, Belgium. In 1902 Henri Jonckheere built his first "luxury automobile". In those days many, largely wooden bodies with their typical styling, were built upon several famous chassis such as Minerva and Rolls-Royce. In 1922 Henri's son and successor Joseph Jonckheere built his first bus body. Yet car bodies were still a large part of the production until early 1930s. Joseph Jonckheere moved all of the production to bus and coach building, making Jonckheere the Belgian market leader. Jonckheere was also becoming a famous and well-known name throughout Europe. After the second world war there was a huge need for vehicles for road transport, which included of course a lot of buses and coaches. Jonckheere was able to meet quickly all new market trends. 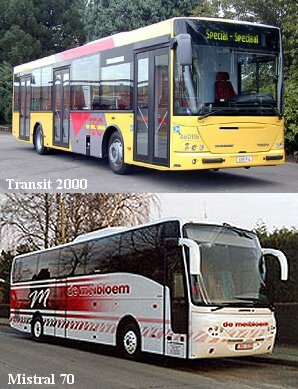 The product range included luxury touring coaches, city and intercity buses, articulated buses but also heavy duty buses for world-wide export and several special bodies. In 1981 Jonckheere celebrated its first century with a touring coach with the appropriate name the 'Jubilee'. Other later coaches came with such names as Bermuda, Deauville and the Mistral. In 1994 Jonckheere became a part of the Berkhof Group which was subsequently acquired by VDL Groep in 1998.